After recently fitting 33" x 12.5 tyres to my TJ, I was in need of some more tyre/guard clearance, as with only a 2.5" suspension lift, they were hitting hard on full articulation. Without wanting to re-do the suspension, a BL (bodylift) was a good option, and with many on the market, it was time to start researching. In the end it was a toss up between the 1" Teraflex and the 2" Performance Accessories kits. With only needing that extra inch to clear the tyres, I decided to go with just the 1" Teraflex Lift. As a kit, it is pretty straight forward, and fairly easy to install. My only negative opinion, is that the install instructions could be slightly more detailed for those of us that are fairly un-mechanically minded. BUT in saying this, it didn't detracted from the kit at all. Step 1 Loosen all 11 bolts that hold the body to the chassis. There a 3 along each side under the sill, 1 under the front grill, 2 above the fuel tank(these ones are the hardest to get to) and the two at each rear corner of the tub. (See Figures 2,4 5 & 6). You need to do 1 side at a time, so leave the opposite side set of bolts still in, as you don't want the body to dislodge while jacking. 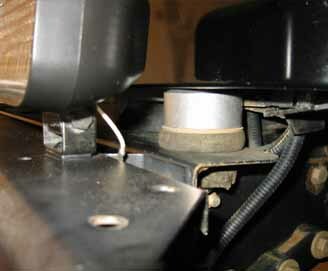 During this time, also undo the radiator fan shroud. Step 2 Jack the body up only enough to slide the new BL pucks in over the old ones. Before you do this, it's a good idea to pull off the old ones and clean them, as mine had a bit of dirt in them. Once replaced, place the new pucks on top and slowly drop the body back down onto them. (See figure 1) You should now be able to thread the new bolts through and finger tighten them. Now repeat for the opposite side. Step 4 Assuming that you are not fitting a Motor Mount at the same time, the radiator fan shroud now needs to be dropped back down 1" in order for the fan to clear it. Drill the four mounting holes on it 1" lower than standard and then screw back in place. 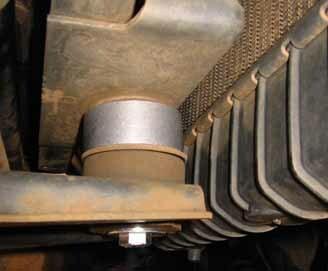 While you have the bonnet open, check the vaccuum line that attaches to the inlet manifold. This may have become dislodged as the body was lifted. Step 5 Now fit the supplied transfer case linkage bracket to the original bracket (See Figure 7). 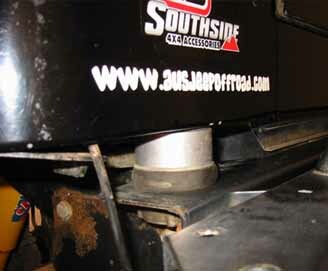 To do this, you need to pull back the carpet on the passengers side, below the transfer case lever and undo the 4 10mm bolts. 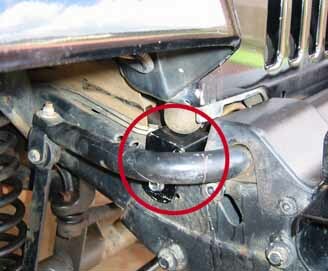 Then remove this bracket from underneath and bolt the supplied bracket to this as indicated in the supplied diagram. 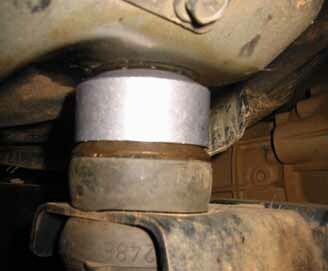 Depending on whether you have a transfer case drop kit with your suspension, means there are two ways to fit it. 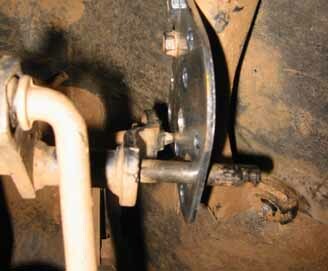 Once bolted together, rebolt the original bracket in place and your transfer case lever should shift between gears the same as before. And that's it. A relitively simple install that can be done with minimal tools or mechanical knowledge or experience. A well chosen Body Lift in my opinion, and a definate recommendation for those looking to go up in tyre size but not willing to spend large amounts on new suspension set-ups. REVIEW OF PRODUCT TO DATE: So far, I've been thoroughy impressed with the Body Lift. It has given me the extra 1" lift which was enough to clear the tyres on full articulation. You can now see this by looking at (Figure 8 ). As with all Teraflex products, the components are expertly crafted, with high quality bolts, washers, and perfectly finished aluminium lift pucks. 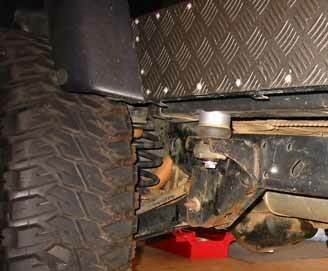 ABOUT TERAFLEX: TeraFlex has been actively involved in Jeeps since 1959. We strive to make products that will maximize the Jeep's performance, both on road and off-road. 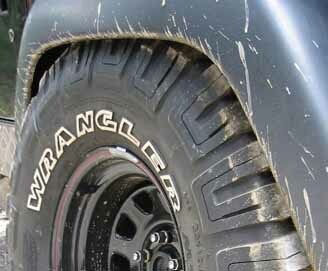 TeraFlex suspensions provide extreme off-road performance with a highway ride that is unmatched. We actually got the Body Lift free as a promo from Teraflex direct from the US, but i've seen it retail (in the US) for as low as $90US dollars plus shipping. No alterations to the steering column at all, and the only adjustment was the fan shroud, which was just redrilled 1" higher then lowered, as mentioned in the write-up. Still drives like a dream, with only the slightest driveline vibes upon take off. The brand of my wheels is "US Wheel" and the model is "Daytona Black". They are 15 x 8 with 4" backspacing, wearing 33" by 12.5 Goodyear MTR's. I got them from a place called "Fourby's" which is in Marooka in Brisbane. They cost $110 each to supply them and to fit the tyres which i had already. 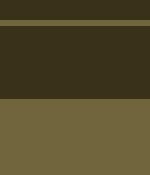 Hope that helped. If you need any more info. just yell. Wot you talkin bout fool? Fresh like a box of Krispie Kreams! Sorry for the grave dig, but was there any problems with the fuel filler etc? Did it need to be loosened or retightened? With a 1" the fuel filler doesnt need to be touched. At 2" you need to fit extra parts from the kit which come with a kit. Epic grave dig. Nice one.